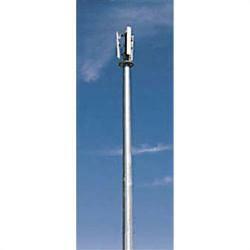 The ROHN DEP120LA 120-ft light duty direct embed monopole is available exclusively from TESSCO. ROHN pre-engineered monopoles offer the perfect balance between durability and convenience. The DEP120LA is designed to be installed in hours as opposed to days. SImply excavate a hole, insert the pole base into the ground and backfill with the appropriate aggregate. Attachment clips for step bolts.